There are some people who live in neutral, some who live in drive and some who live in overdrive. The same can be applied to living with color. Last week I was lucky enough to visit an amazing home belonging to people who definitely live in color overdrive. The owners of this beautiful house purchased it as construction was already underway by a local high end custom home builder. 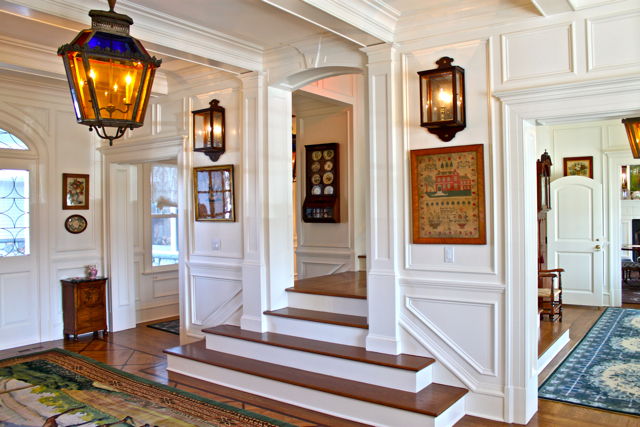 With substantial shingle style architectural and millwork details already in place they were able to customize and change some elements including all the hardware to bring the house up to their level of sophistication. But the magic really began when they initiated the decorating phase. 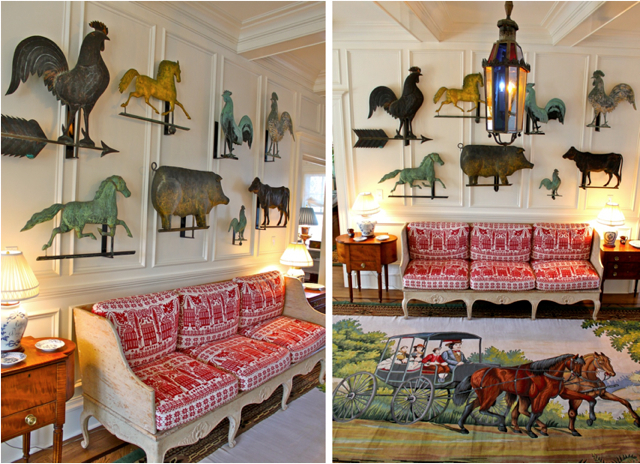 The wife, a lover of color and pattern and long time collector of everything from majolica and Meissen to country antiques, knew she had found kindred spirits when she discovered the work of William Diamond and Anthony Baratta through a friend. Although originally hired for an Adirondack vacation home she was planning, the team was ultimately assigned to this house. Whether or not you share their all-American technicolor vision of the world, there is no denying the talent behind the design duo’s dazzling creations. Their mind boggling attention to detail and dedicated arsenal of skilled craftsmen who execute their version of traditional crafts are impressive. 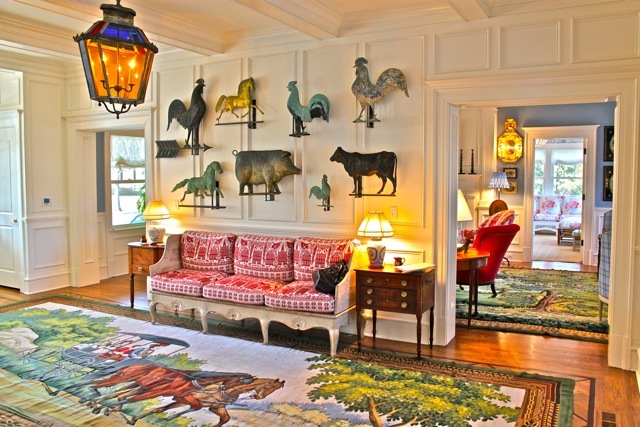 The front entry includes a collection of antique weather vanes and a custom needlepoint rug based on the wife’s love of Currier and Ives prints. 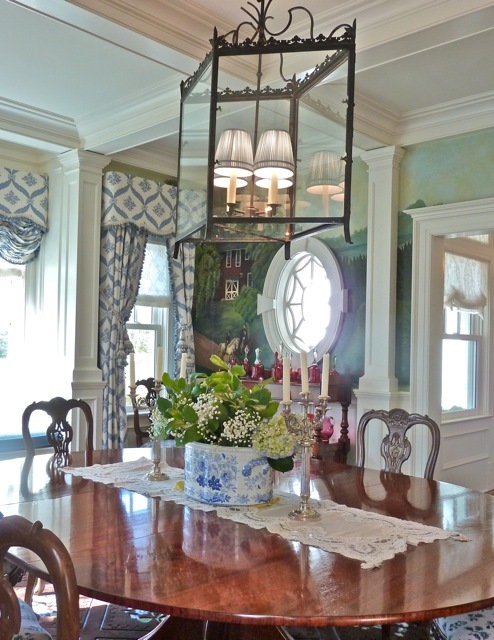 The designers and owners found the antique lantern in London on a buying trip and had an exact copy made for the adjoining entry hall. It is a testament to the designers’ stable of artisans that it is virtually impossible to tell the difference. 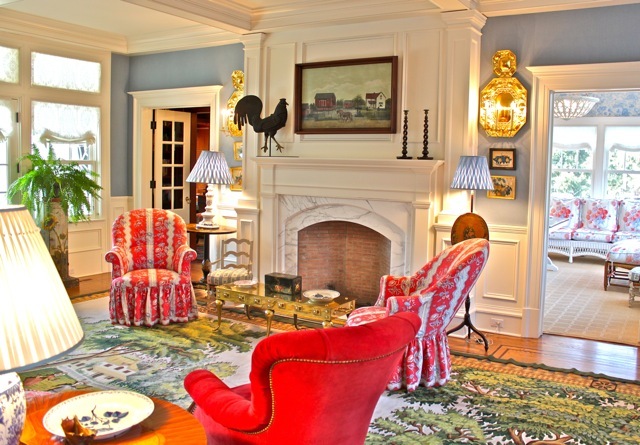 The living room includes another Currier and Ives inspired needlepoint as well as a mix of antiques and collectibles from the owners’ collection and items bought together with the designers. 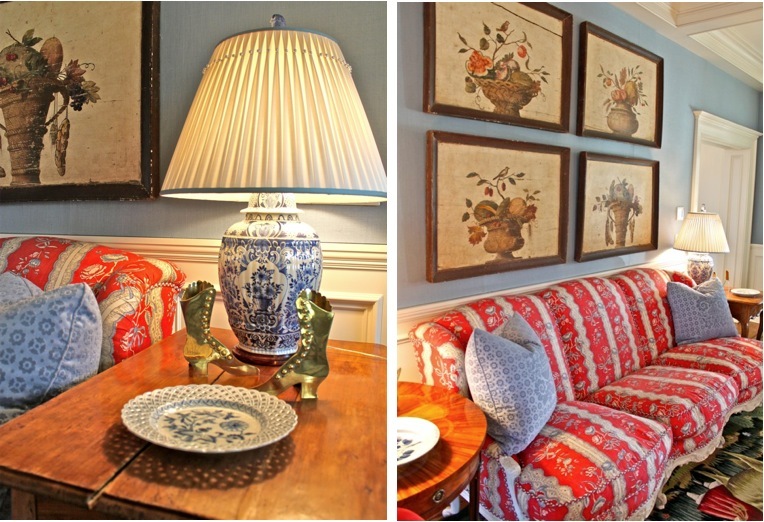 Thoughtful vignettes in opposite corners include similar but not matching antiques. 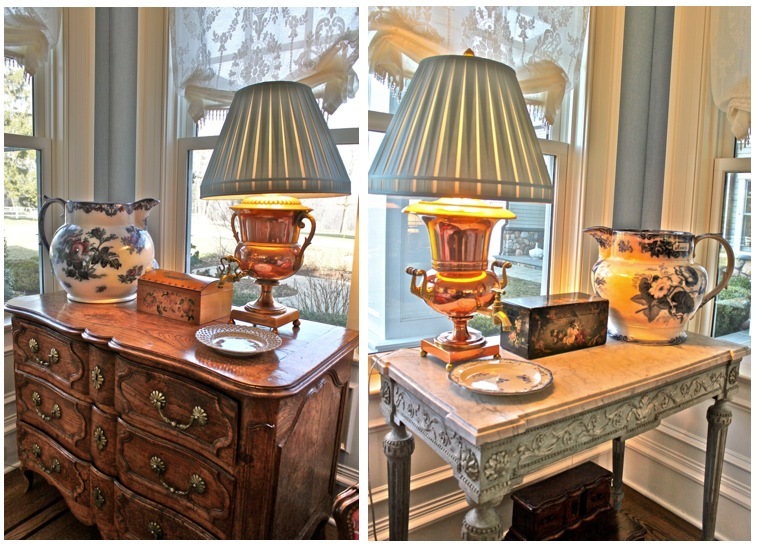 One of Diamond Baratta’s signature touches is lamps made from unexpected sources. Off the living room is the owner’s cheerful office. 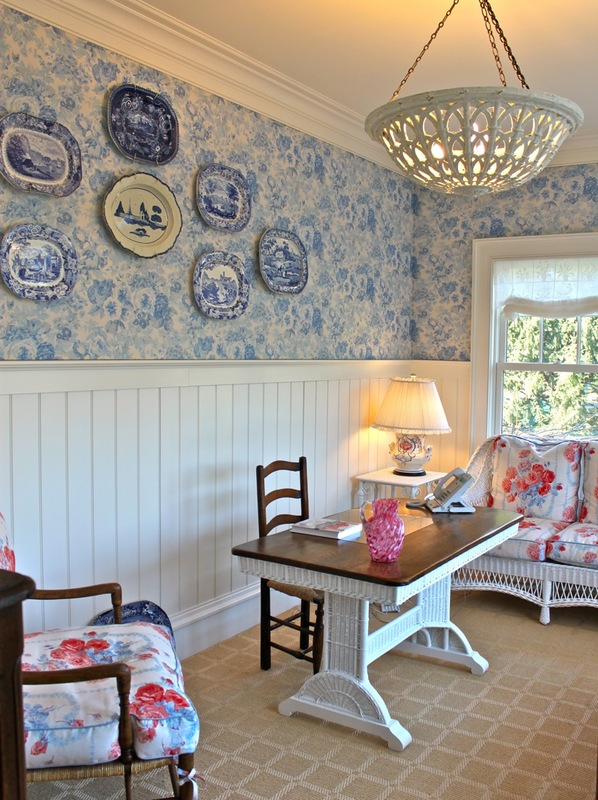 The upholstered walls, wainscoting, wicker and chintz contribute to the room’s cozy country chic. 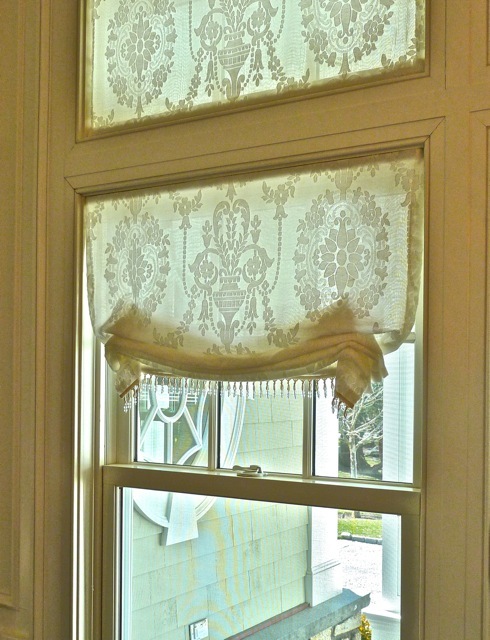 Back in the entry, looking in the other direction, you can see the careful color coordination with the dining room ahead and attending details such as the pretty bead trim on the lace curtains. But first, do you see that arched door on the left? 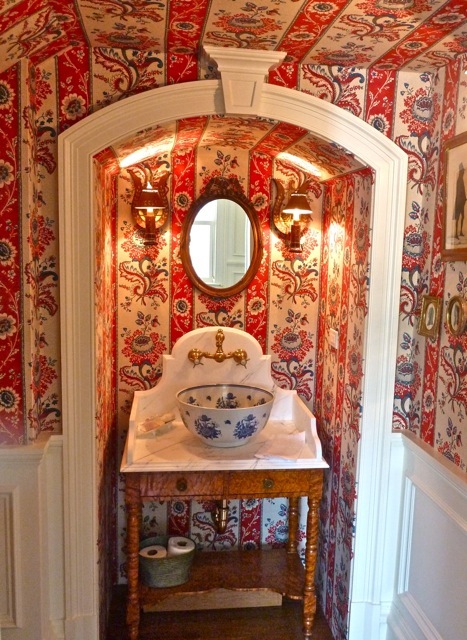 It leads to one of my favorite rooms in the house – the front powder room. Oozing with charm, the matching arched openings of the entry and barreled ceiling alcove with pattern covered surfaces fully envelop you in an appealing melange of provencal pattern and American accoutrements. These types of nook and cranny spaces are what so many builder’s boxes are missing. Every detail in this jewel box is pitch perfect. From the beautiful custom vanity and brass fixture to the tole sconces and collection of silhouettes. 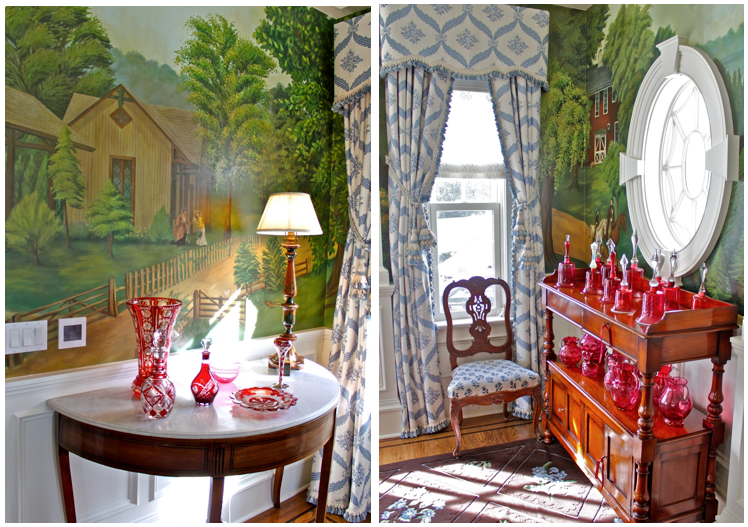 with its sparkling collection of cranberry glass and custom mural by Andrew Tedesco, depicting the local train station (on left below) and the red barn from the owners’ previous house (below right). Within the painting are hidden the names of the family – parents and all five children. The wife admitted they still haven’t discovered them all! The kitchen is classic Diamond Baratta. This all American version of red, white and blue is a tour de force of masterful coordination. 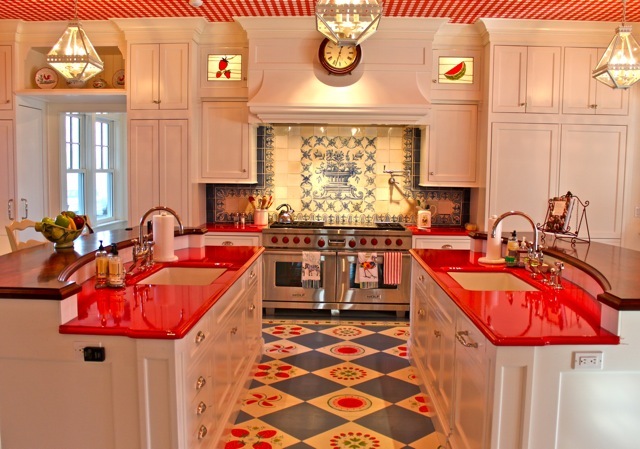 The stenciled floor, red lava stone counters, checked ceiling and delft tiled backsplash are a perfect panoply of pattern! The room is chock full of design details – high shelves around the room house collections of majolica, rabbit ware and vintage signs, alongside custom stained glass cabinet doors and tole lamp. The wife’s antique copper collection is proudly displayed on an unusually long antique drop leaf table. 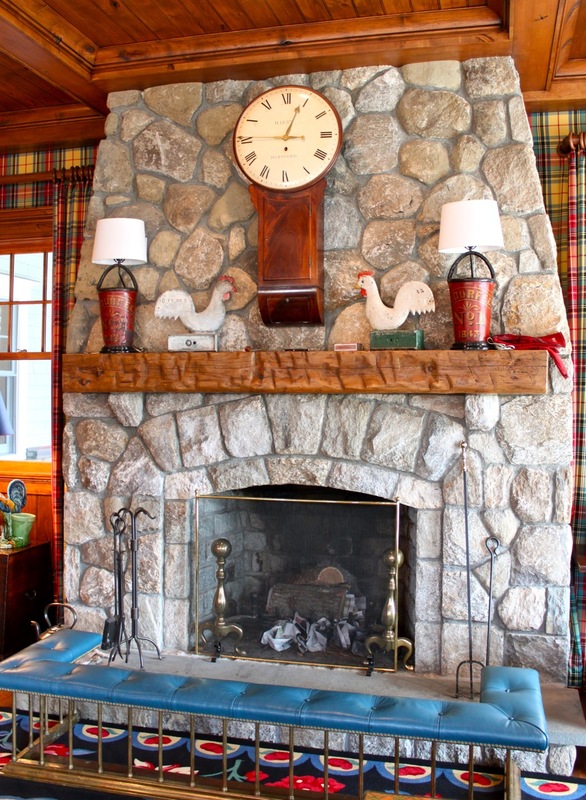 The kitchen opens to the family room, a rustic homage to the Adirondack house they never built. Tartan and brights happily co-mingle as in this personalized wing chair. Each initial represents the first name of one of the five children. 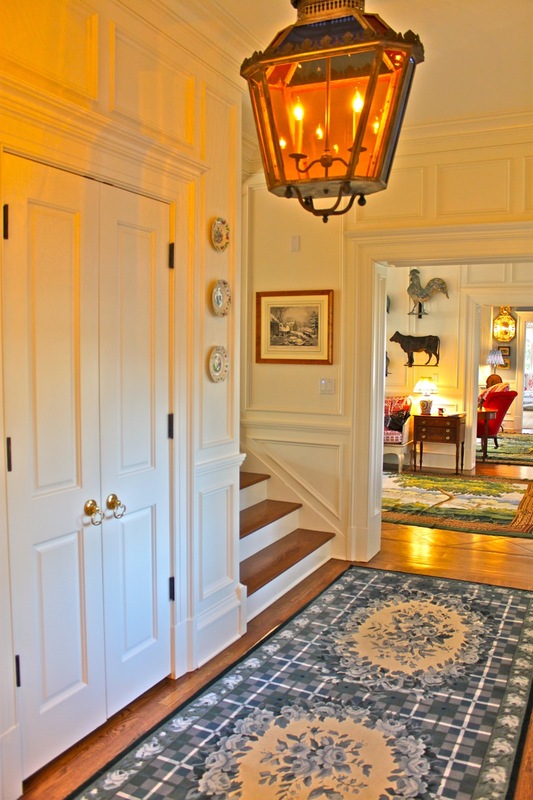 Our next installment will take a look at the other floors in this amazing country retreat. This entry posted in architecture, design, furniture, interior design. 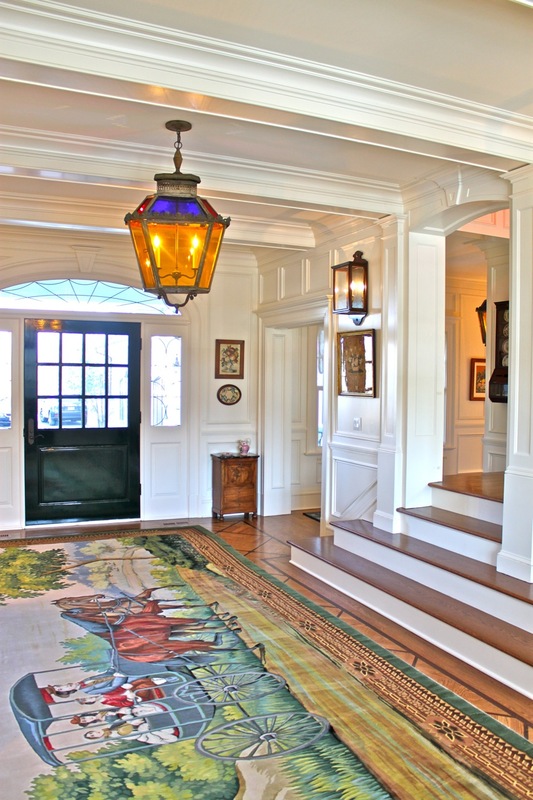 Entry Tags: interior design, Luxury homes Connecticut, Needlepoint rugs, Shingle style homes, Stencil floors Bookmark the permalink. I can only imagine that house on the fourth of July must be in it’s red, white and blue Americana glory. Thanks for sharing this home Stacey. Beautiful! I adore the work of D+B, not to mention that fab kitchen floor here! Can’t wait to see more! LOVE seeing inside this Diamond Baratta designed home! You know how much we love this color and whimsy!! Thank you, Q! That is quintessential New England and when it’s done well, it’s simply stunning!! 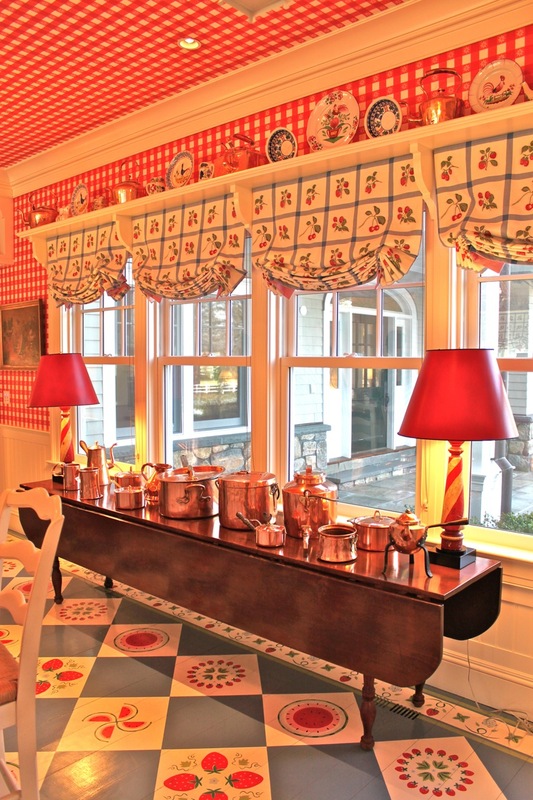 I love this interpretation of New England traditional style! I love the weather vane and antique copper collections. The personalized wing chair is very cheerful and tastefully done- very original and sweet to have initials of their children! Thanks for sharing! How lucky of you to see this house in person! I have admired it for some time! 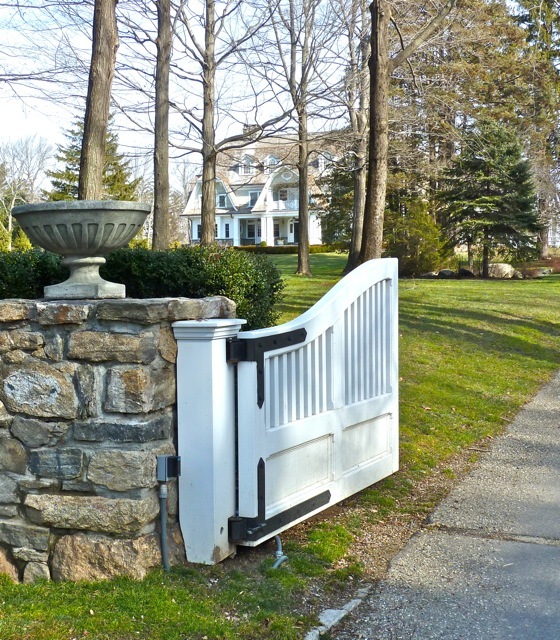 Stone walls and white gates – love! And the house just makes you feel happy and welcomed! How fun to visit! Would love to visit this home. The designer is very talented. While it is a little bright for me, it gives a warm and happy feeling throughout. The collection here is astounding. Gorgeous. Thank you for sharing, q! Speechless! 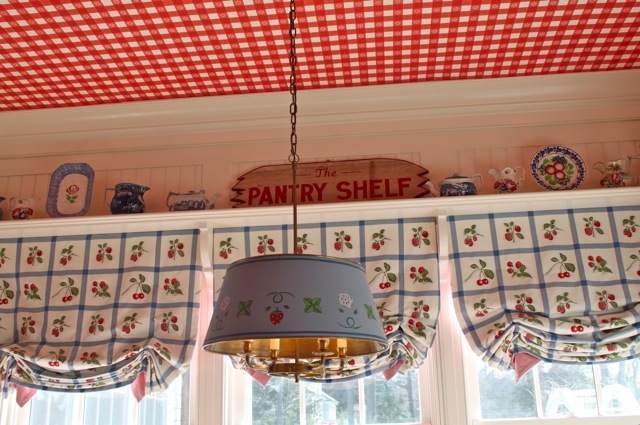 The weather vanes, the kitchen, the vanity.. all the details! The floor is gorgeous. How fun to be there in person! Love all the color, pattern and texture here! The one thing I, personally, would not want are all those steps leading up to what, from what I can see, is the main staircase! A lot of un-carpeted, slippers steps! But the woodwork and floors are just gorgeous. This looks very English style with a modern twist. Love all the color. I’m glad to see color making a come back into our lives. this would never be my personal style however when a design is this thoughtful and creative one can only fall in love. would kill for that weathervane collection! What a happy house, Stacey! Wouldn’t it be wonderful knowing the owners? Hope you had a chance to meet them. Sending love, cookie-belle…. I love this house, it is just perfect. 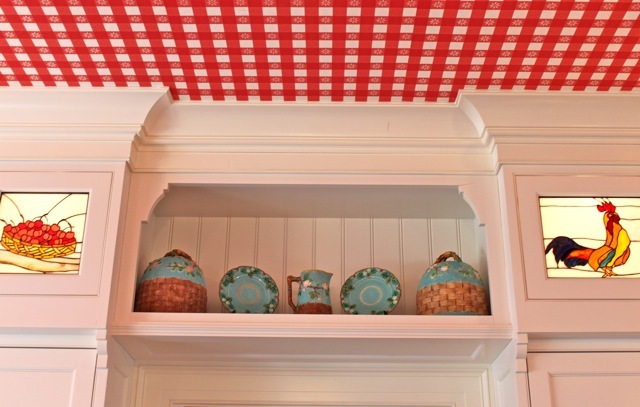 The woodwork is fabulous and quirky details show a fun side to the family who own it. 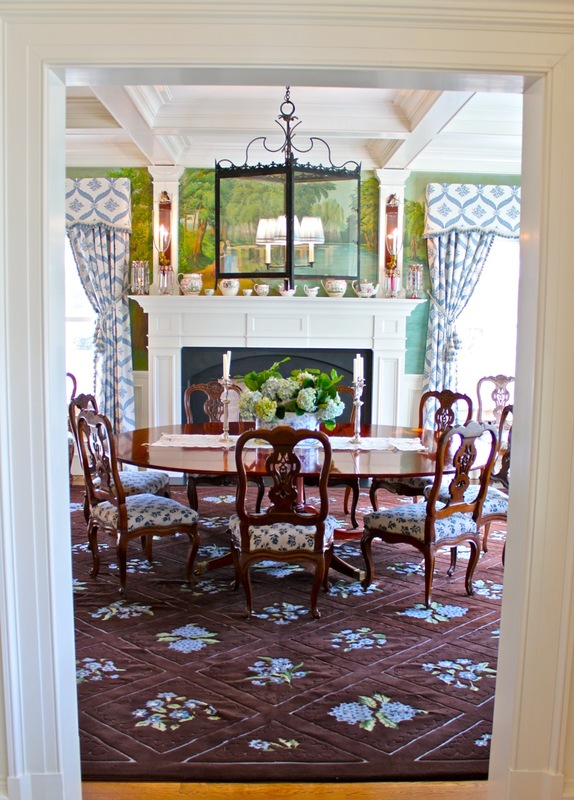 Whether I like needlepoint rugs or plaid is irrelevant, the designers truly captured Living the American Dream! Thanks Stacey for showcasing it and sharing it with us! my kind of house. lots of colour and patterns! beautiful feature! This such a happy looking house — I can’t wait to see the rest. Wow…what a house!!! I am so drawn to color right now….and what a dream to have Diamond Baratta design your home!!! Thank you for sharing this and to the lovely couple of welcoming us in!!! What a gorgeous house! As you said, the millwork and the architecture are impressive. My favorite thing is the painted wooden floor in the kitchen. I’ve always loved that feature in a house! what a great tour-I do admire the panache of their interior design, also the ability to live in a space. 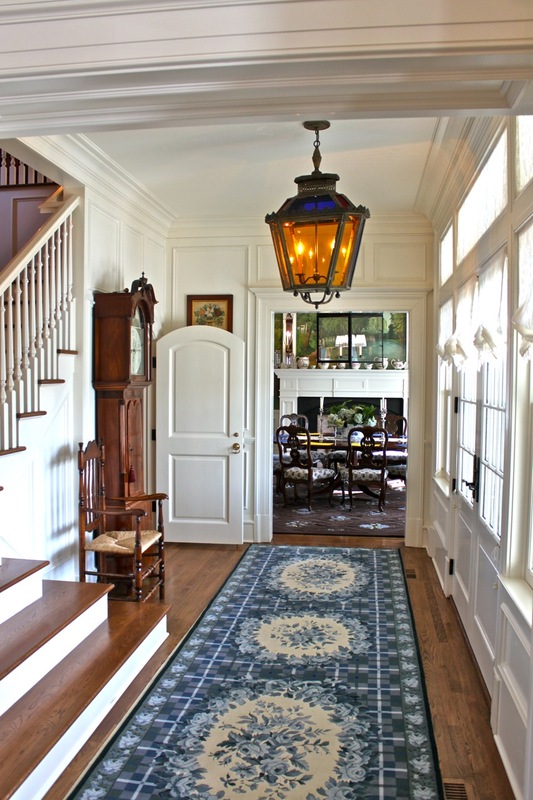 the idea of a large family dashing through these rooms-blurs of energy is obvious. I do think the downstairs living and public spaces- barring an overloaded K. is wonderful, the private spaces I would think could have a more calming, freer atmosphere. I know you enjoy the personal tour. Wow. I read the 2nd post first so wasn’t surprised by all the color and activity in this one. I love the weather vane and copper pot collection and I’d give up chocolate for that range (for at least a month anyway). I guess I’m a neutral gal because my house is mostly all white. Funny, I never thought of myself that way. I can’t believe I missed this post. 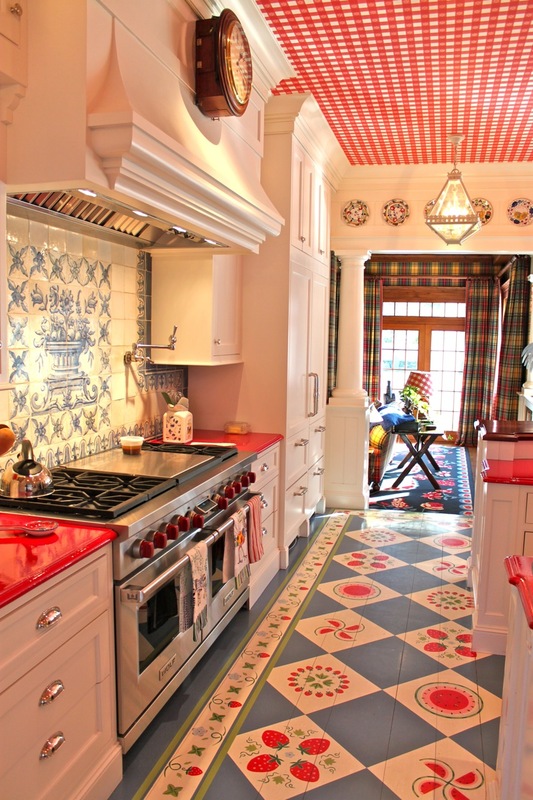 I love that ceiling in the kitchen and the colored glass in the foyer lantern. It just oozes New England, so different from how everyone decorated in Texas. I really enjoyed this peek. What a lovely, comfortable, colorful home! Oh my Lord! Don’t know how I missed this post! Two things, actually three have my heart going pitter patter. The millwork, the lighting, and the oh so wonderful Diamond & Baratta. What I love the most though is that “happiness” appears in every nook & cranny of this real life “home” – a testament to the owners & their choice of designers. Beautiful house! I believe Country Club Homes out of Wilton was the custom home builder. They do great work! I saw this amazing kitchen on AtticMag and had to come over to see the rest of the house! Architecture has been a long-time passion, so, to begin with, I love the house and its details… I’m totally envious of the stairway that opens to so many directions. 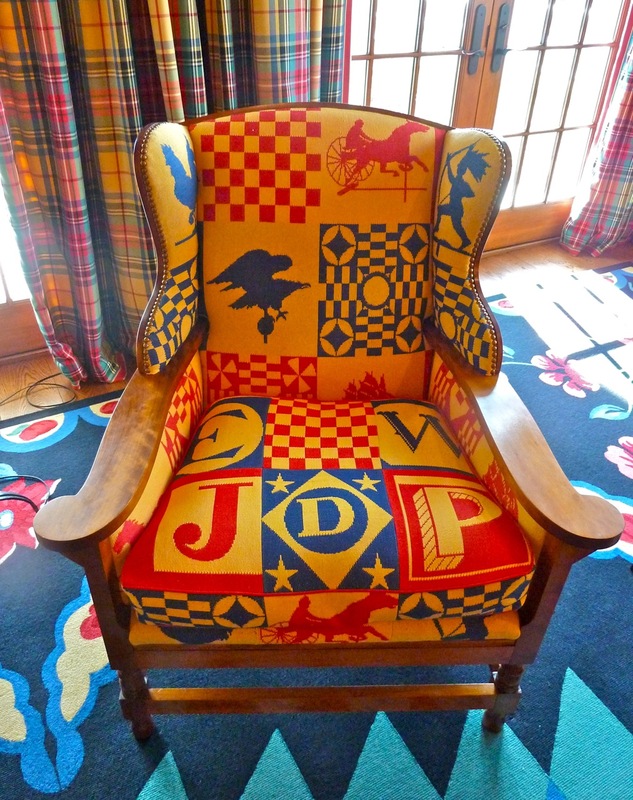 I am also in Connecticut and I am wondering if you could print the name of the upholsterer who covered the chair with the children’s needlepointed initials? Hi Eugenie – I’m afraid I don’t know the name of the upholsterer. This house was designed by Diamond and Baratta – you would have to contact them for any of their sources. The firm is now under the name of just Tony Baratta here: http://www.anthonybaratta.com/home.html and their contact info is: [email protected] Good luck and let me know if I can be of further assistance! Thank you for the contact. I will look into it! Love the kitchen floor & the mural with the family names and the red barn. Going to check the artist’s link you put up now. Thanks for posting this imaginative home. 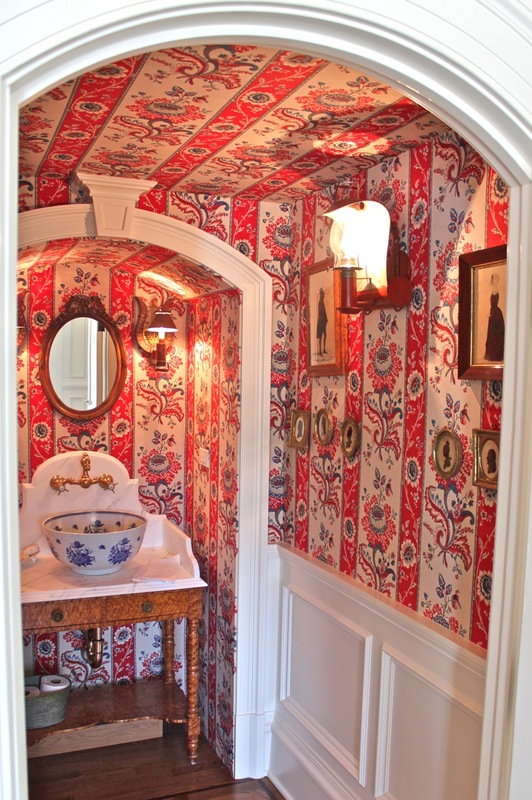 Do you by any chance know who makes the red and blue floral wallpaper in the powder room?? Where can I find the stencils for the kitchen floor? I just love the look! My teeth were really set on edge by constant references to “the wife”. Surely this woman has a name, and is a person in her own right?